A well-designed lawyer’s website should help you increase the number of clients you get and position you and your law firm as the best experts in your particular area of practice. As such, your law firm website design needs to reflect your core values and expertise as well as be professionally designed. With a professional design, your website will help you build your credibility, establish trust in potential clients, and help you convert more website visitors into clients. If you’ve been wondering how to make sure your website helps you achieve all that, you’re in the right place. 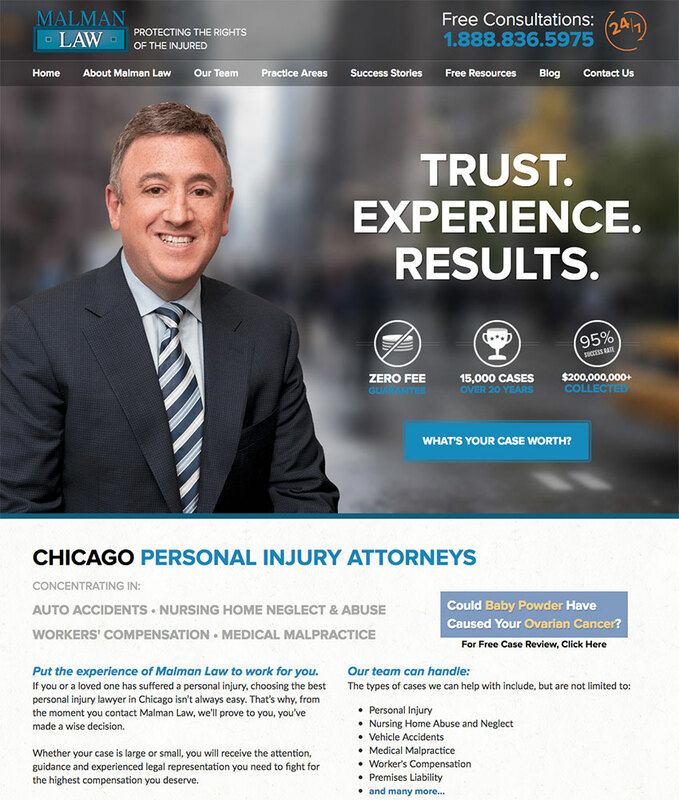 In this post, we’ll share features every lawyer website should have and show you examples of some of the best professionally designed websites for attorneys to serve as your inspiration. 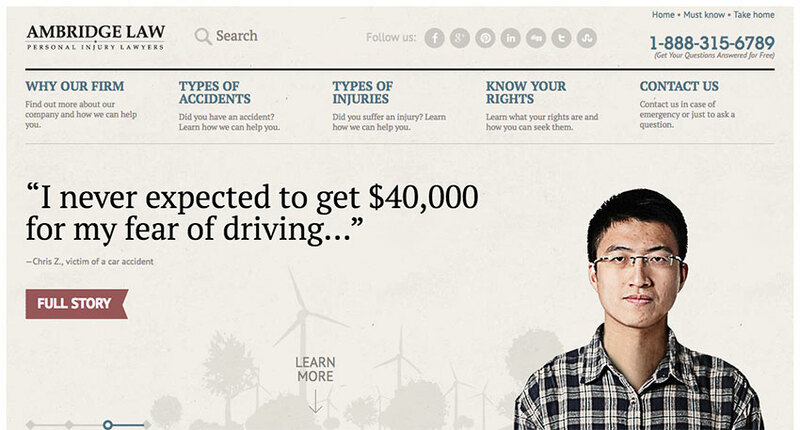 What Makes a Visually Great Lawyer Website? It goes without saying that every legal website should have an attractive design that uses your brand’s colors, fonts, and your logo. You should also consider features that are necessary for any type of website—lawyer and attorney websites included—such as responsive design, fast loading times, and clean and simple navigation. Those features will improve user experience for any visitor, regardless of which device they’re using to access your site. List of services or areas of practice. With so many legal specialties, it’s necessary to list your areas of expertise. This allows visitors to immediately know if you’re the right type of lawyer who can help them with their case or if they need to keep looking. Once they know they’re in the right place, they’ll be more inclined to schedule their initial consultation. Achievements and publications. Listing your achievements and publications is a great way to showcase your expertise and knowledge, which can help build your credibility and convince potential clients that you can not only handle their case, but win it too. Lawyer profiles. If you’ve got several lawyers employed in your law firm, listing their profiles helps visitors understand which lawyer specializes in the area of the law relevant to their case and learn more about that lawyer’s achievements, skills, education, and ways to contact them. Online booking form. You’ll also want an online booking form so potential clients can schedule their consultation without having to call you on the phone or email back and forth to agree on the perfect time and place. Calls to action. Lastly, your website needs to have several calls-to-action that’ll encourage visitors to schedule the consultation or otherwise get in touch with you. The websites for lawyers on this list have beautiful designs, but also make excellent use of the features mentioned above. 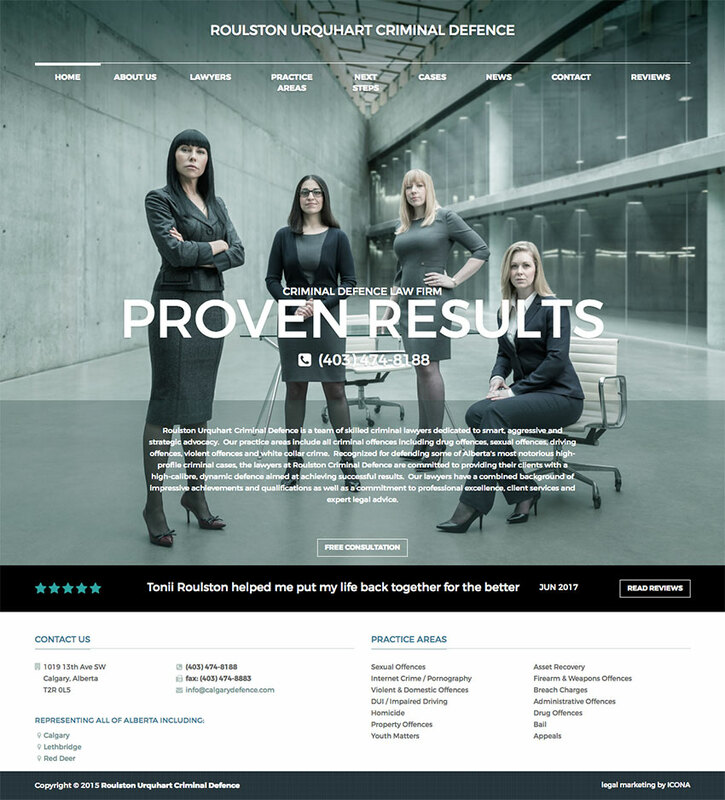 The first law firm website design inspiration on our list does an excellent job of using the header to display a credible testimonial and establish their authority. 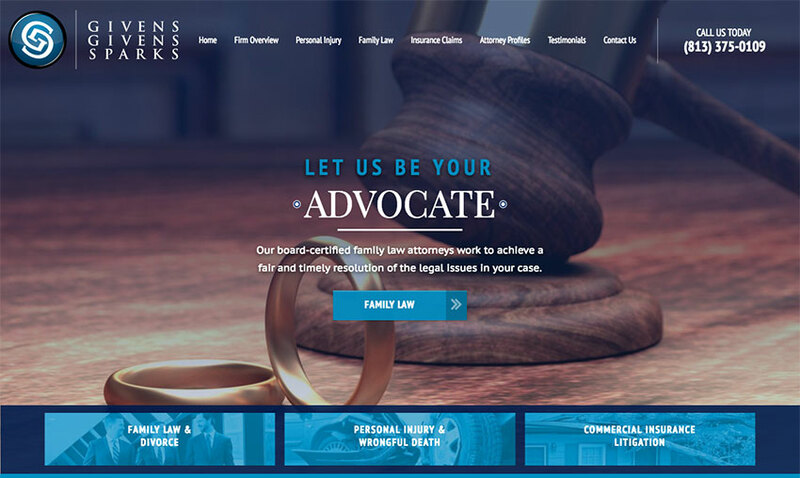 Their website uses plenty of whitespace to make the important numbers about their law offices stand out and the homepage offers an easy way to find a lawyer from their company in your area. Turks Legal has a very simple homepage that makes it easy to see what areas of the law this company specializes in and to explore the services they offer in each area. You’ll also notice the navigation area has links that take you to specific sections of the website and a top header that invites you to connect with them on LinkedIn. This website uses an attention-grabbing header image to showcase what they do. The rest of the homepage does an excellent job of establishing their expertise and authority. 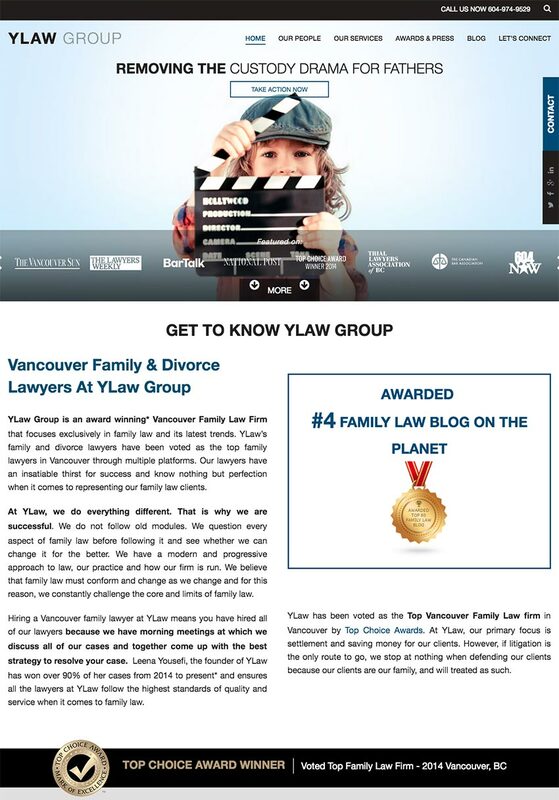 You’ll notice a list of achievements, awards, and results this law firm was able to get for their clients. They also use several calls to action throughout their website that encourage potential clients to call them. 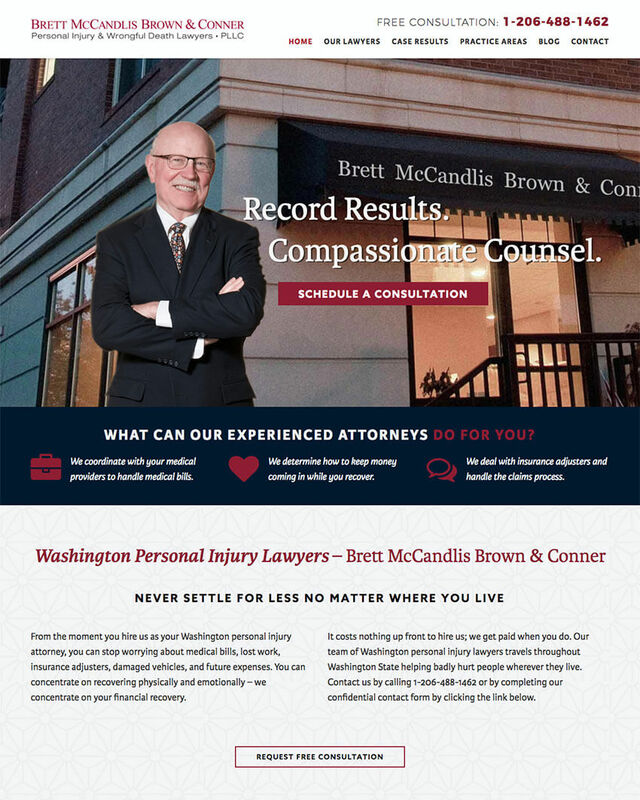 What makes this lawyer website design stand out is the excellent use of the contact form right on the homepage that begs visitors to fill it out as well as the live chat box that allows you to immediately talk to someone about your legal problems. W3IP Law’s website also doesn’t shy away from showing their past clients’ testimonials and describing their process to further build trust with potential clients. This law firm practices several different areas of the law, but they make it easy to contact the right lawyer for your case. You’ll notice the header uses a slideshow, which features different areas of the law, followed by a call-to-action that takes you to the appropriate page. The law firm also lists their numerous accolades, awards, and results that attest to their expertise. 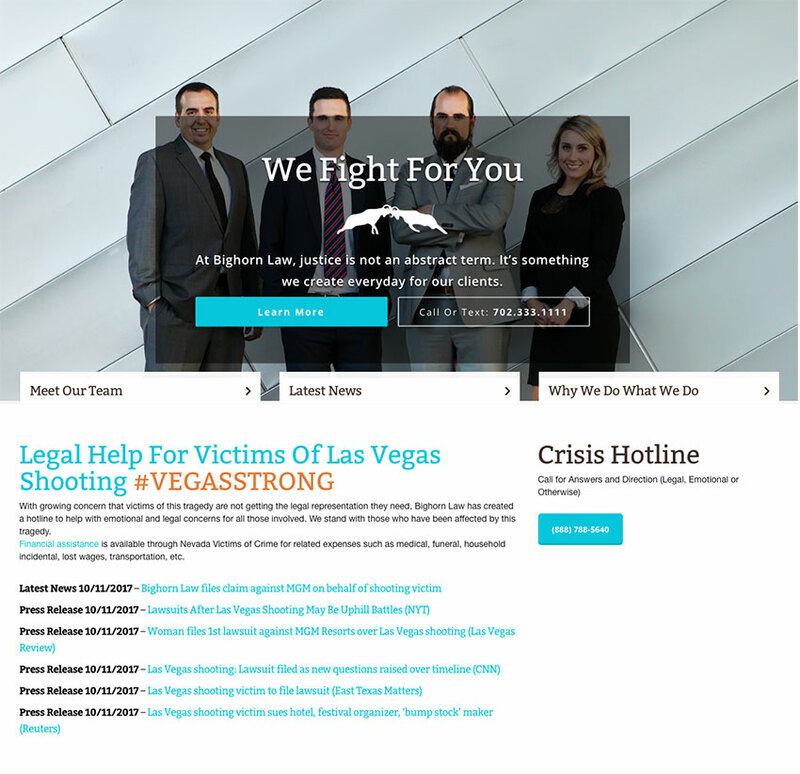 Like other websites for attorneys on this list, Bighorn Law uses photos of their attorneys to add a personal and human touch to their brand. It’s easy to learn more about what this particular firm specializes in as well as give them a call or engage in a conversation. What sets this legal website design apart is their settlement calculator, so you can easily find out what you can expect. 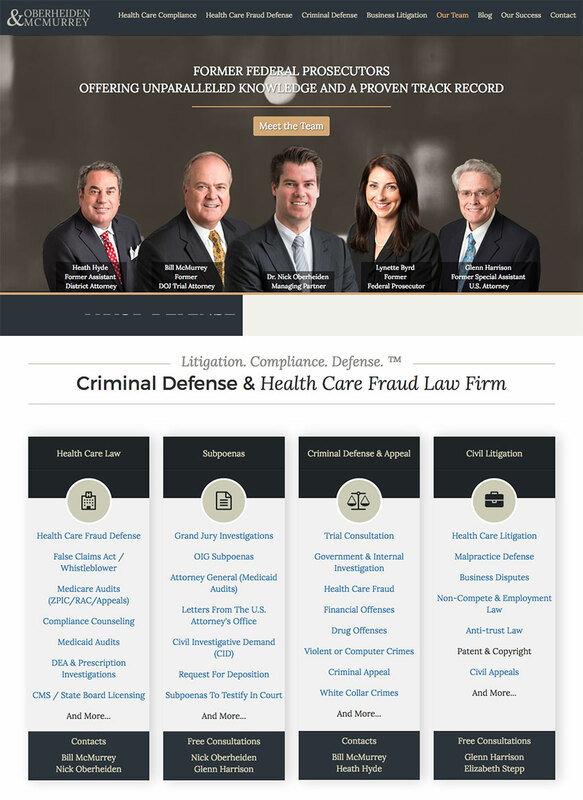 If you’re looking to create a clean and simple website, take cues from the Lash & Goldberg law firm website design. Their website is a great example of a minimal law firm website that still manages to explain all the relevant information a potential client would need. West Coast Trial Lawyers use a video right in the header to welcome website visitors and explain this firm’s philosophy and major success. Their call-to-action right at the top is straightforward and does an excellent job of prompting you to call them. 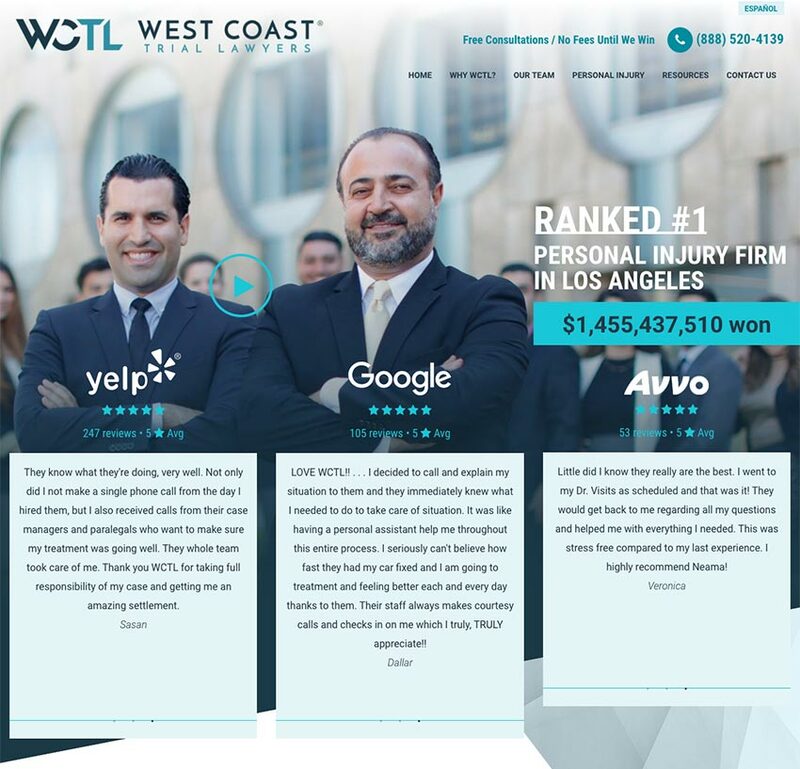 West Coast Trial Lawyers also makes use of the live chat functionality, listing their areas of practice, and showcasing testimonials and attorney profiles. 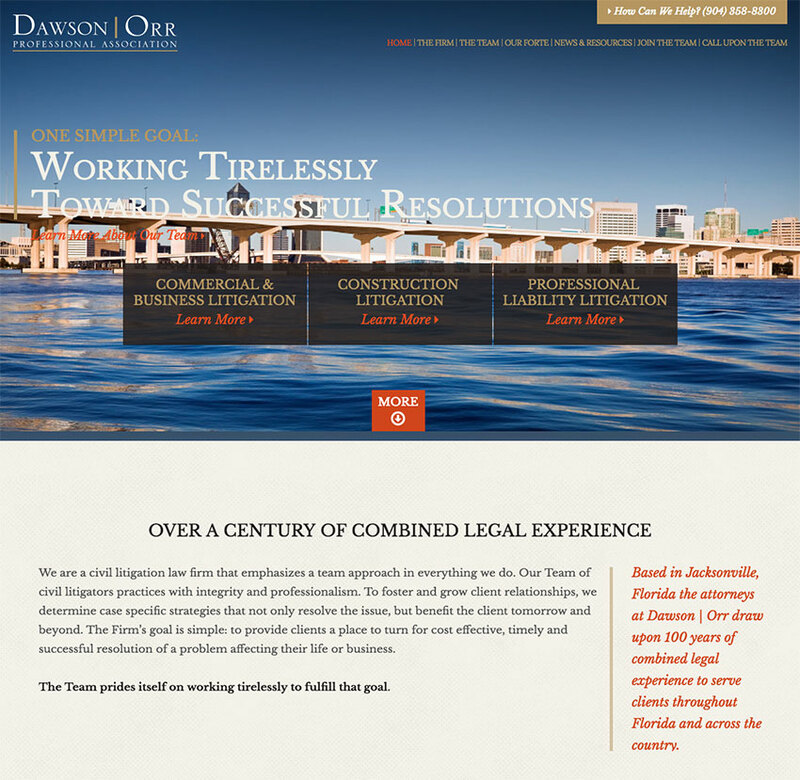 Another simple website for lawyers, but with a header that makes a lasting impression. A photo of the lawyer team serves not only to make a personal connection to, but to give you confidence that your case is in the right hands. Pair that with a simple call-to-action and a list of their practice areas and it’s easy to understand that you should schedule your free consultation if your legal problem belongs under their area of expertise. 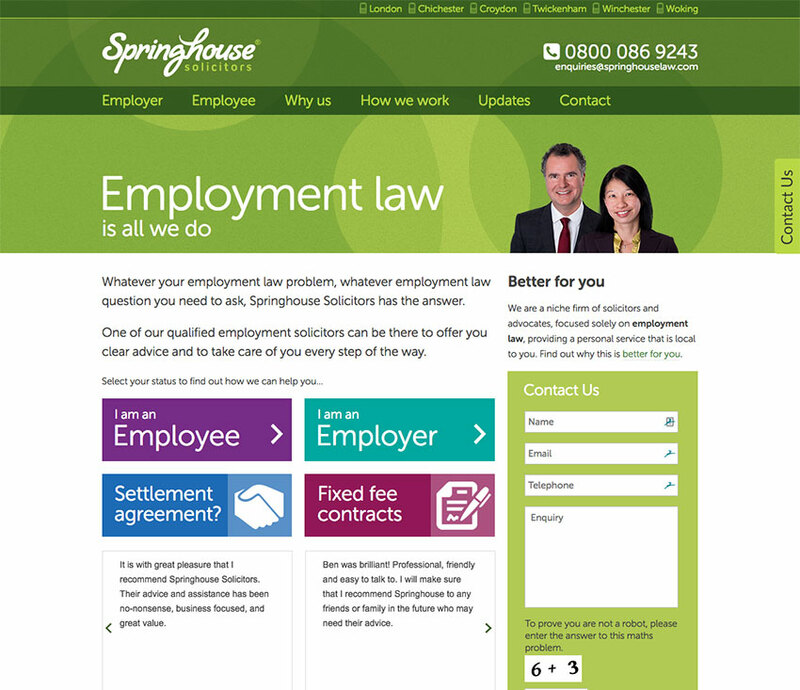 Springhouse solicitors’ websites offers a clear message on the type of law they practice and an even clearer path of where you should go to find an answer to your problem. The homepage also has a convenient contact form and a popup form that asks if you would like a callback, making it easy for you to schedule a consultation time that works best for both them and you. A smiling lawyer paired with the words “Trust. Experience. Results” makes for an excellent case of a compelling header image. This lawyer website design has all the standard elements you’d expect in a lawyer’s website, but it also goes one step further and offers the ability to browse through their free resources and get educated on your rights through their articles, downloads, FAQ and video center. It’s hard not to trust lawyers who’ve held important government roles in the law industry and Oberheiden & McMurrey’s website capitalizes on that. The call-to-action is always present as a sticky footer and you’ll also notice a detailed list of their areas of practice along with individual lawyer profiles. 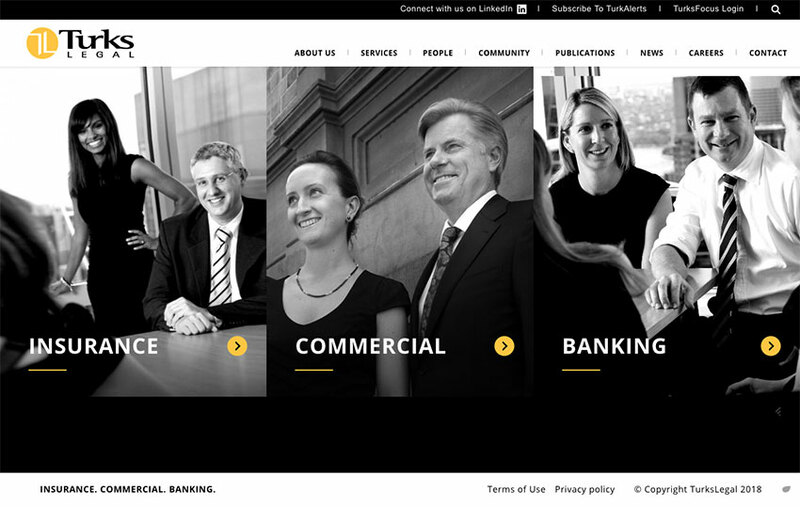 Finally, their website further instills trust with a list of their accolades and case studies. 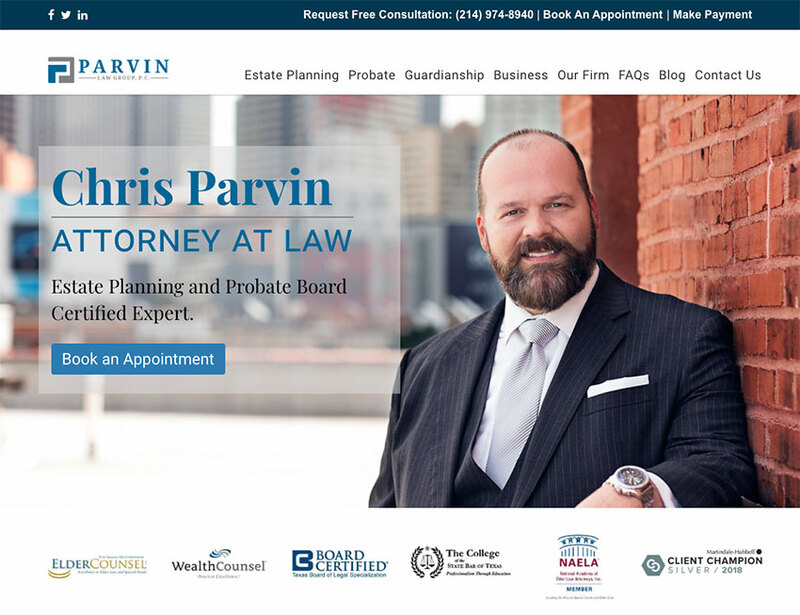 Parwin Law Group uses a simple call to action in their header that takes you straight to their booking form. Making the decision to schedule a consultation is a no-brainer considering areas of practice are listed right above the initial call to action. Parwin Law Group lists not only their achievements, accolades, and testimonials, but also presents all the reasons for why you should hire them. You’ll also notice the call-to-action is repeated in the sticky top header that is always visible thus increasing the chances of visitor conversion. The law industry can be a competitive one so using words like “We do things differently” is a great way to grab the attention of potential visitors and pique their curiosity. This is followed by a list of their practice areas and a list of their social media profiles and contact information that makes it easy to get in touch with them. 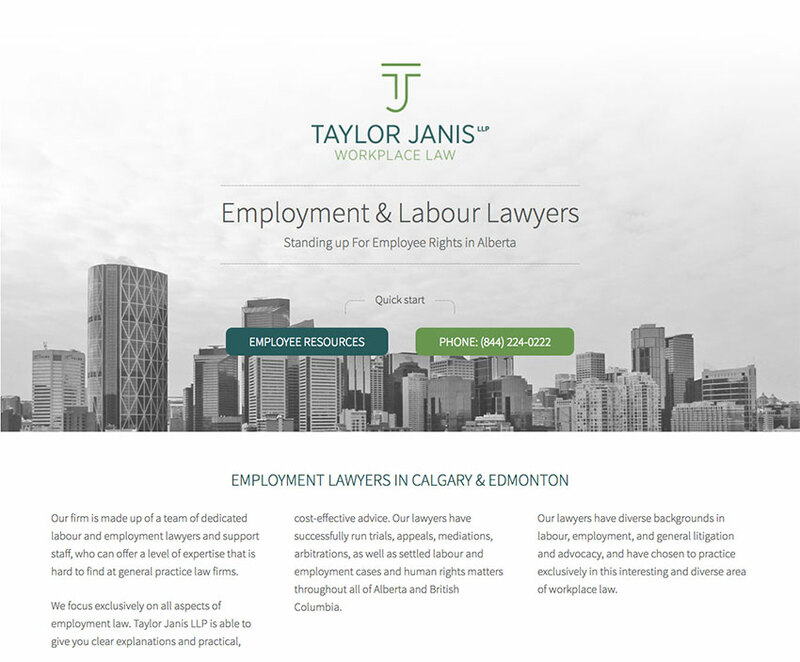 Taylor Janis Workplace Law makes it obvious what area of the law they practice, not only in their company name, but also the header area of their website. Furthermore, they make it easy to get advice either by calling them or browsing through their list of resources. This website stands out thanks to their creative and visually appealing way of presenting their areas of practice. Their call-to-action is also easy to spot and there is even a handy live chat box to immediately talk to someone and facilitate scheduling a consultation. If you’re looking for a law firm website design that conveys a friendly, yet professional tone, look no further than IdeaLegal. Their website uses friendly and reassuring language as well as hand-drawn icons that make them feel approachable. However, that doesn’t mean they leave out other important information. On the contrary, you’ll find acknowledgments and past client logos that build their credibility as well as lawyer profiles so you can learn more about them. 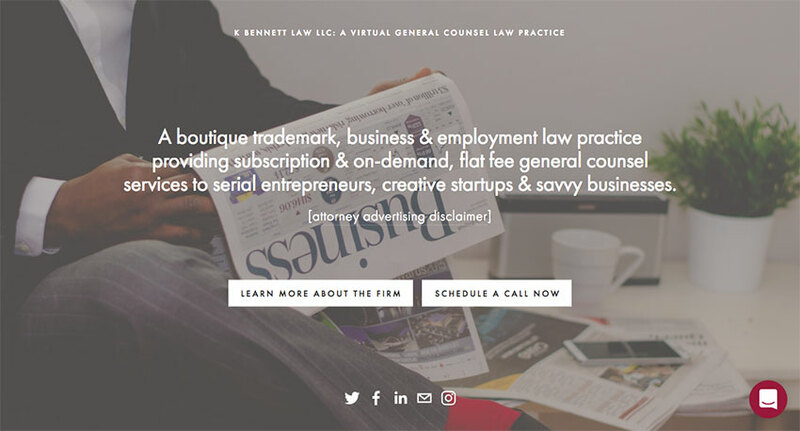 K Bennett Law uses a simple homepage that describes what they do and allows you to either learn more about the team or schedule a consultation. This law firm website design is rather minimal, but does a great job of making it clear whether she is the right type of lawyer for your case and establishing a clear path for you to follow. 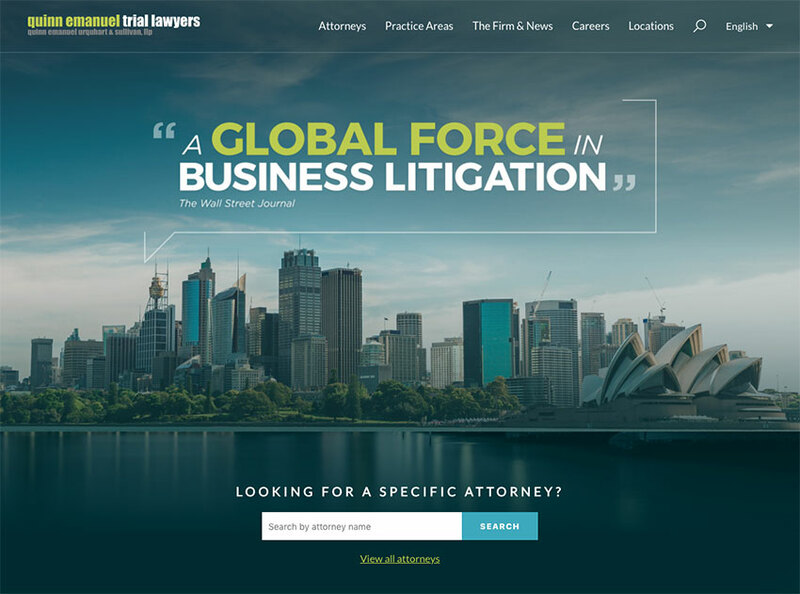 Feldman, Kronfeld, & Beatty is another minimal lawyer and attorney website that puts the main area of practice into focus and eliminates all distractions. You can’t miss their phone number, so it’s easy to get in touch with them. The firm goes a step further by including a map in their footer, so you can easily find them come appointment time. Dawson Orr uses an attention-grabbing header that lists their areas of expertise along with a subtle call-to-action prompting you to call them. You can learn more about the firm as well as the lawyers. This legal website design is straightforward and focused on getting you to understand if they can help you and then taking action towards hiring them as your legal team. 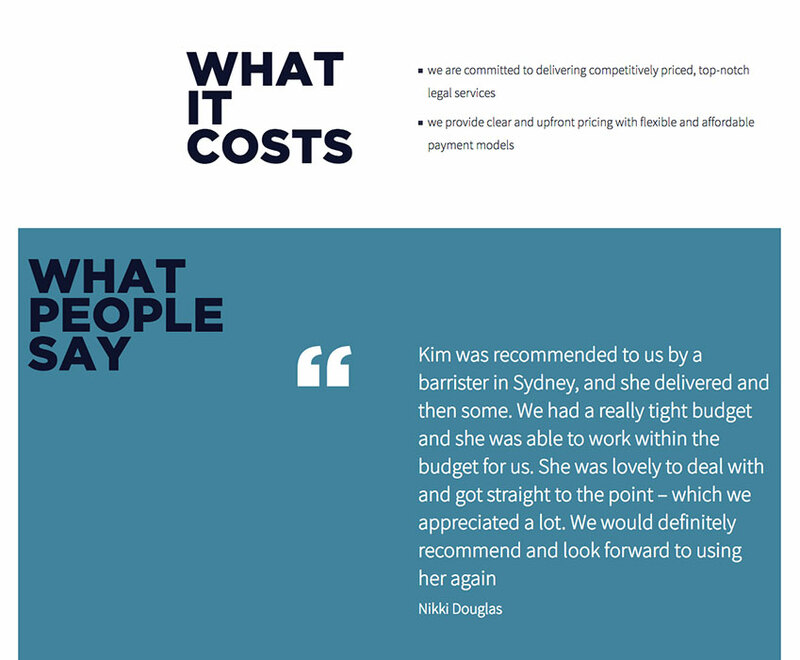 What makes the Ambridge Law firm website design different from others in the law industry is the use of testimonials in their header image, which speaks volumes about the expertise and skills in their area of practice. It’s also easy to navigate to other sections of the website and see at a glance what services they offer. This website uses bold copy throughout their website that not only helps you understand what they do, but also makes you feel confident they know what they’re doing in the courtroom. Number sliders, list of recent successes, and testimonials further build trust and you can easily see the entire spectrum of their services and case studies. We hope that our list of the best lawyer websites inspired you and encouraged you to get started with your own law firm website. 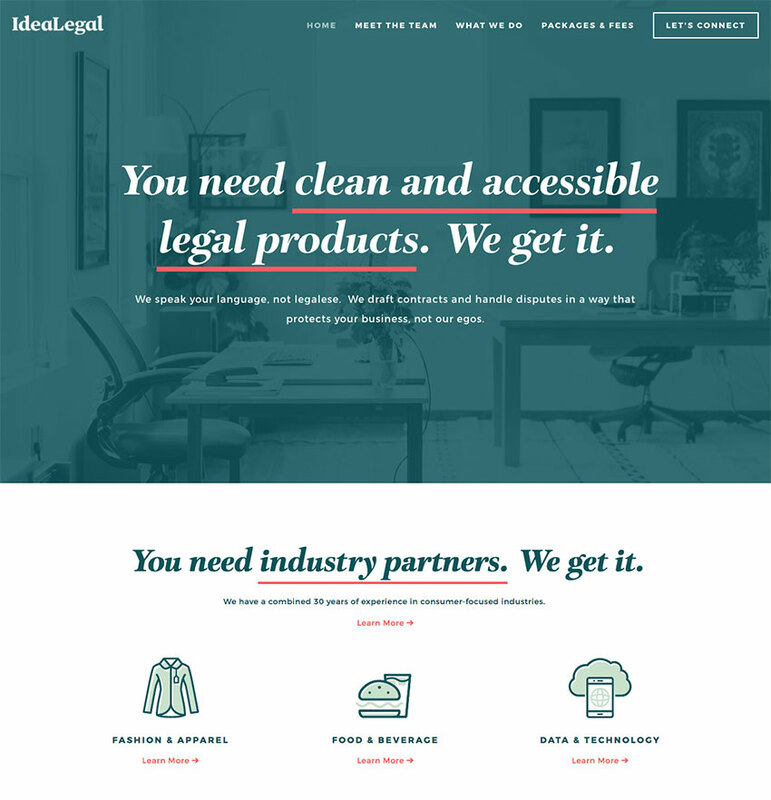 If you need help getting started, start by checking out our selection of the best legal website design templates and follow this guide for getting your site up and running quickly. Happy launching!